Contact us for details on availability and current mileage on this Loaner Vehicle. This Service Loaner Vehicle, Original MSRP: $65,460. Sapphire Blue Metallic Exterior with Black Leather Interior. Sport Exhaust System incl. Tailpipes in Black, Driver Memory Package, Porsche Entry & Drive, Lane Change Assist (LCA), 21" Sport Classic Wheels. We want your Trade-In! Aggressive pricing and competitive trade values! Porsche West Broward is the new international standard for Porsche Dealerships with a state-of-the-art 66,000 sq. ft. indoor showroom and service department. PWB has 21 service bays, a quick alignment machine, on site paint & wheel repair, and an amazing detail facility. From a simple oil change to something more complicated, our highly trained factory-certified technicians can have your car back on the road in no time. We also provide Porsche service loaners as well as a complimentary shuttle service for all of our customers. We are confident to say that you will not find another Porsche dealership with PWB's facility, capabilities and high quality of service. 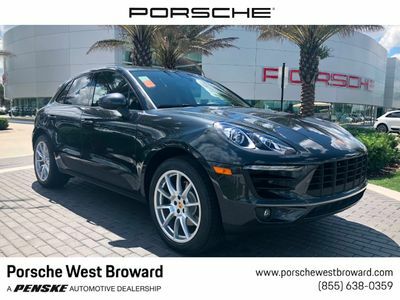 Porsche West Broward is conveniently located at 4641 SW 148th Ave. Davie, FL 33331, and sells to customers nationwide! We're determined to be there for you throughout the life of your vehicle, and we're committed to providing you with the highest quality Porsche service. We exist for our customers and do our best to make every customer happy. We require honesty and integrity in everything we do, and we will live up to our commitments. Contact us today at 855-638-0359 for more information, or fill out our Online Credit Application to begin the pre-approval process today. Full Factory Warranty. Contact seller for details. All advertised prices exclude government fees and taxes, any finance charges, any electronic filing charge, and any emission testing charge. All advertised prices exclude a $999.95 dealer fee.